The silver 13.3" ThinkPad L390 Laptop from Lenovo is designed for business purposes, featuring the performance, security, and portability users need. Specs-wise, it's powered by a 1.6 GHz Intel Core i5-8265U quad-core processor, 8GB of DDR4 RAM, and a 256GB M.2 Opal2 SSD. Should you need more room, you can attach external storage solutions using its USB ports, as well as quickly offload data to other devices with its microSD card reader. Its 13.3" screen, driven by integrated Intel UHD graphics, features a multi-touch Full HD 1920 x 1080 IPS display for crisp and clear HD playback. Moreover, it has an HDMI port that you can use for connecting a display for larger viewing and enhanced multitasking. Other integrated features include a fingerprint reader, Wi-Fi 5 (802.11ac), Gigabit Ethernet LAN, Bluetooth 5.0, a webcam, a microphone, speakers, and an audio in/out jack. The operating system installed is Windows 10 Pro. The ThinkPad L390 is designed to be secure, reliable, and mobile. Its discrete TPM 2.0 chip and a Match-on-Host fingerprint reader help to safeguard data. Baked into its DNA is durability. What's more, it weighs from just 3.2 lb and can be used anywhere. Thanks to the high-performance Intel processors, high-speed DDR4 memory, and a 14-hour battery life, the ThinkPad L390 is no slouch. It also has Rapid Charge to boost the battery back up to 80% in just one hour. For advanced security and manageability, you can opt for a model with Intel vPro technology. 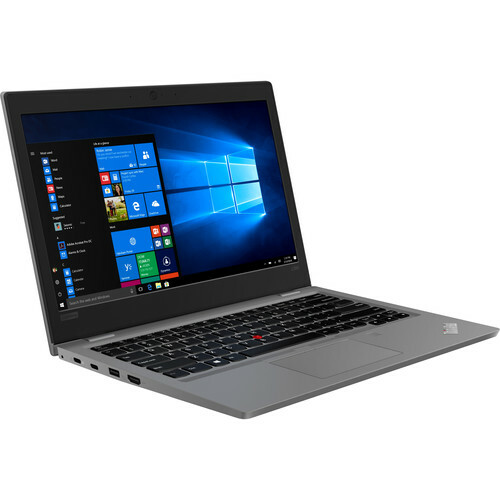 With a full range of ports, including two USB Type-C outputs and a single HDMI output, plus smooth wireless technology, the ThinkPad L390 lets you hook up all your favorite devices and stay in the loop wherever you are. There's an anti-glare 13.3" display for wide-angle viewing and enhanced colors. Moreover, the ThinkPad L390 has a backlit keyboard, which is perfect for low-light environments. The 180° folding hinge on this laptop lets you lay the display completely flat, so you can easily share on-screen content with onlookers. Box Dimensions (LxWxH) 18.6 x 12.0 x 3.1"